In early March, the first production version of the all-new Toyota GR Supra rolled off the production line at the Magna Steyr, Graz Plant in Austria. But customers shouldn’t get their hopes up of getting their hands on the first production model―this one is already taken! The rights to the phantom matte gray Supra, VIN 20201―”2020″ for the year, “1” marking the first production model out of the production line―with red mirror caps, matte black wheels, red interior with carbon-fiber inserts, and an engine cover signed by Toyota Motor Corp. President Akio Toyoda, was previously auctioned for charity at the 48th Annual Barrett-Jackson Auction at West World Scottsdale in Arizona. The winning bid for was for $2.1 million, and the proceeds of the first of the fifth-generation Supra went to support the American Heart Association (AHA) and the Bob Woodruff Foundation (BWF). “Without the support of all the various people and parties related to the Supra, this day could not have come true. Partnerships come in many forms, and our partnership with BMW has been a new experience for both of our companies. We appreciate the enthusiasm and aspiration of everyone that has helped Supra become one of the most anticipated and exciting cars coming out this year. Thanks to you, I am proud to say that Supra has turned out to be a very exciting car,” said Tetsuya Tada, Toyota Chief Engineer. “It was exciting to see the first Supra roll off the line! Though we had our set of challenges, we believe this Supra will show the passion, thoughtfulness, and commitment that we have all had as we designed this iconic sports car and can’t wait to see both old and new Supra fans all over the world on the roads soon,” commented Nobi Nakamura, project chief designer for the Supra. 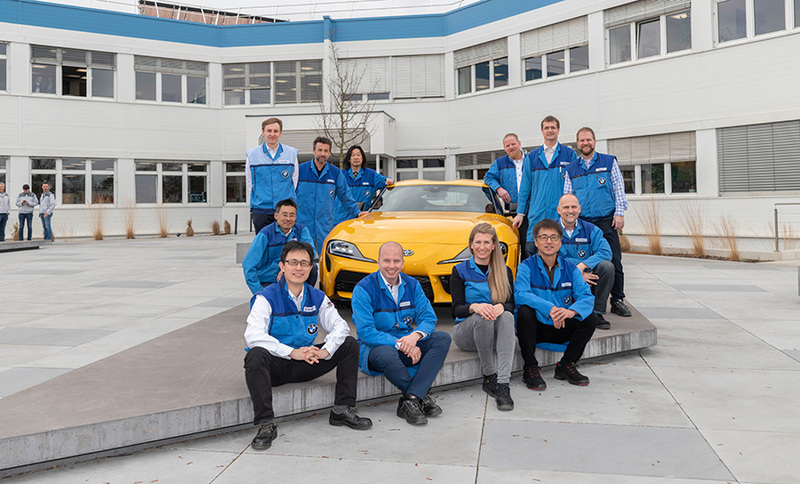 To prepare for the Supra line-off, Toyota engineers travelled to the Graz Plant several times and performed quality checks together with the production members.